Welcome to our guide to help you choose the best espresso machine under $500? Most people think you have to spend thousands of dollars to get a good espresso machine, but you don’t. Yes, obviously you can spend a lot of money on a high-end espresso machine, like the Saeco Picobaristo (HD8927/47) or the Breville Oracle (BES980XL). And yes, they have more options, but for most people you can get a fantastic espresso machine for under $500 — which is exactly why we wrote this article. How do you make the perfect espresso? There are a lot of finer details that go into the process. But it all starts with having the right equipment. To make the best espresso, you need the best espresso machine. If you look at the equipment used by a professional barista, you’re looking at thousands of dollars. This begs the question: can you afford to own one of the best espresso machines for your home? We’ve tried to answer that question by seeking out the best espresso machines under $500. Do they make the grade? Yes they do. Whilst these are not commercial grade espresso machines, with the right care and techniques you can make aromatic espresso, creamy lattés, and the perfect cappuccino. All in your own home and you don’t have to break the bank in order to achieve this. So I’ll start by reviewing the best espresso machines costing less than $500. But that’s just the start of it. Having the best espresso machine is half the battle won, making the best espresso means knowing how to utilize what you have. Once you’ve found the espresso machine that best suits your needs, keep reading. We’ll then move on the vital part of the puzzle. How to make the perfect espresso. I’ll provide you with all the tips you need to get that perfect crema, aroma and flavor that can compare to finest coffee shops in the world. You’ll find it all in one place. A review of the best espresso machines to match your budget and a guide on how to achieve perfect results. As with any product review, we have to start by recognizing that everyone has different needs. For one person, the best espresso machine is the one that requires the least amount of effort and knowledge. For another, this may mean an espresso machine that does the same job as a high-end professional machine. These may require a bit more effort and skill to use, but you’ll be getting a product that compares to that of the most renowned coffee houses anywhere. Then there’s the ever important question of budget. We all want the best. Though our bank balance may not agree with our idea of what the best is. Without wasting your money on trash, you want to pay a reasonable price for an espresso machine that delivers the goods and keeps doing so for a long time. By looking at what’s available and researching what the user experience has been with these products, I believe we’ve come up with the perfect list of the best espresso machines under 500 bucks. We’ve looked at different users and their individual opinions. That way we’ve been able to find the best for everyone – if that’s possible. Bottom line, there’s a great variety of very affordable espresso machines in this review. Each has their strong points and it will depend very much on what you’re looking for, which will be your number one choice. Whatever constitutes the best espresso machine for you, I believe you’ll find it in this review and come out on budget. Best espresso machine under $500. Espresso pressure gauge monitors extraction pressure. Automatically adjusts water temperature after steam. 1600w thermocoil heating system with integrated stainless steel water coil accurately controls water temperature. Settings : Single or Double Shot Volumetric Control & Manual Over-ride. Easy programmable control offers preset 1 & 2 shot volumes, manual override, or reprogrammable volumes. An Italian 15-bar pump delivers water at the ideal pressure, while the 1600W stainless-steel Thermocoil and electronic PID temperature control ensure precise temperature during extraction for fullest flavor. Low-pressure pre-infusion gradually increases water pressure to gently expand grinds for an even extraction, balanced flavor and thick crema. Auto purge automatically adjusts water temperature after steam for optimal espresso extraction temperature. Stainless-steel swivel steam wand froths milk for lattes and cappuccinos. Dispenses hot water instantly for Americanos. Dry Puck feature removes excess water from ground coffee after extraction for easy disposal. 61-fl.-oz. removable water tank with handle and replaceable water filter. Accessories: single & dual wall filter baskets, coffee scoop, stainless steel jug, cleaning disc & tablets, cleaning tool, water filter with holder. Please note: There is a “Black Plastic” insert inside the stainless steel bowl of the portafilter, this is meant to reduce heat loss experienced when espresso hits cold metal also prevents any “splashing” from the dual wall pressurized filter baskets. PRECISE ESPRESSO-EXTRACTION : Maximise flavor potential with low pressure pre-infusion, digital PID temperature control, adjustable in 4⁰F increments and pressure gauge that guides you to the right extraction. MICRO-FOAM MILK TEXTURING : High power 1650W element for high pressure steam and faster heat up to create the micro-foam necessary for a café quality taste and essential for creating latte art. Single or Double Shot. Volumetric Control & Manual Over-ride. This is an absolutely delightful machine, definitely my personal pick of bunch. For one thing, it looks so cool. You have a choice of a brushed stainless steel finish, cranberry red, or black sesame. Then it looks and functions very much like a professional espresso machine – the kind of thing used by real baristas. There’s a big pressure gauge and a few easy to use programmed function buttons. This allows you to do all the stuff that the professionals do with the greatest of ease. The best news is the improvements made on the previous model (the BES830XL) which never quite got the water up to the right temperature. Breville have redesigned the heating coil and this has sorted that issue out. So to my mind, this is not simply the best espresso machine for under $500, it’s the ultimate espresso machine in this price range. Okay, that’s my take on things but I’m sure many will agree. As part of your purchase you get everything that you could possibly need for the perfect espresso, cappuccino, or latté. Except, of course, the coffee beans, water and milk. As far as equipment goes, you get it all and it’s of a high standard. So this includes pressurized and non-pressurized filter baskets (single and dual wall) for 1 cup or two cups, so there’s a total of 4 baskets. You get a backwash insert, coffee scoop and tamper, which is magnetic so it stores neatly onto the machine without hooks or slots. You also get a stainless steel pitcher and a water filter, as well as cleaning discs and a cleaning brush. One thing it doesn’t have is a built-in grinder. Though this isn’t something that bothers me. Later when I discuss how to make the perfect espresso, I’ll explain how important a good quality coffee grinder is. Personally, I’d rather invest in a high-grade grinder than have a cheap version included in the machine. That’s not to say that built-in coffee grinders are junk. It’s just that if you’re already paying less for the actual machine, the grinder can sometimes be an afterthought and possibly not the best. Either way, I’m quite happy to spend a little extra, in the knowledge that I’m getting a grinder that’s going to deliver perfect results, time after time. The improved, 1650W heating coil gets the water to the perfect temperature in almost no time at all. You’re able to adjust the temperature as you wish with an electronic control in increments of 4°F. You’re guaranteed the best steam for micro-foam, essential for a great cappuccino. The steam wand is able to rotate 360°. A purge function will automatically clean the system and adjust the temperature after using steam for the perfect espresso temperature. You also have hot water on tap whenever you want. It has a 61oz water tank with built-in filter. You have a pressure gauge to monitor what’s going on, but everything is done for you. The infuser automatically adjusts the pressure for that all-important process of obtaining the best flavor from your coffee beans. It will start off at a slow and steady pressure, enabling the initial infusion process by gently expanding the coffee grinds. After which, it will increase the pressure for a perfectly balanced flavor. The built-in Italian 15-bar (218 Psi) pump obtains and maintains the perfect pressure for you. The stainless steel drip tray keeps everything tidy and clean. I really like the pop-up indicator that tells you when the drip tray is full, saying “Empty Me”. A simple setting allows you to choose between single or double shots and there’s a manual override if you wish to set your own volumetric control. It has necessary warning systems for low water etc. and a descaling cycle, for hands-off maintenance. For something that looks so cool and functions so well, I’m awe-struck by the Breville BES840XL/A. It’s nothing short of superb and, for this price, it’s probably as close as you’re going to get to the type of high-end espresso machine you’d see in a coffee shop. It will give you the same results, just not in the same type of volume or as fast as the professional-grade machines do. 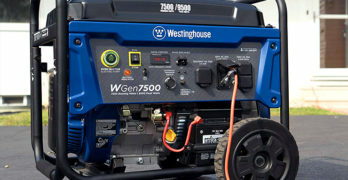 Then again, it comes at a fraction of the price and doesn’t require a high-voltage power supply like the big machines. The Breville operates on either 240V or 120V power, so you can plug it directly into a standard power outlet. Heating System : 1650W Thermocoil–Integrated stainless steel water path accurately controls water temperature. Pre Infusion Function : Gradually increases water pressure to gently expand grinds for an even extraction. Purge Function : Automatically adjusts water temperatures after steam for optimal espresso temperature. Settings : Single or Double Shot. Volumetric Control & Manual Over-ride. Single serve, Super-Automatic espresso machine. all-in-one grinder, brew unit and dosing controls. Best super-automatic espresso machine under $500; designed with a long list of great features that you’ll surely appreciate. Also equipped with a manual frother. Removable Brewing Unit – Easy to remove, rinse and replace, which helps keep maintenance simple. Ceramic Burr Grinder – The adjustable grinder preserves aroma without overheating the beans. Energy-saving Mode – The Xsmall enters stand-by mode automatically after one hour. Volumetric Controls – Program you preferred brew volumes with two programmable buttons. Automatic Rinse Cycle – Before it enters and when it returns from stand-by mode, the Xsmall automatically rinses the coffee circuit. 5-Steps Adjustable Grinders For Better Control : The grind granularity of this espresso machine can be adjusted in 5 settings, from the finest grind, for a full bodied espresso, to the coarsest, for a lighter coffee. Automatic Circuit Cleaning Ensuring A No-Fuss Experience : Vapore has been designed to automatically clean its coffee circuit with water upon starting up or switching off of the machine, delivering a great, fresh taste with each cup of coffee. Customize Your Coffee To Your Preference : You will always get a perfect cup of espresso brewed according to your personal preference thanks to our memo function which allows you to adjust the coffee length to suit your taste. Enjoy a superb coffee drink with just the press of a button. Saeco, part of the Phillips group, is a brand worthy of recognition. So I have the utmost confidence that this a quality espresso machine. Now don’t be fooled by its size, the Saeco Vapore HD8645/47 does everything a larger machine would do and it includes a high-grade ceramic coffee grinder. Because it’s smaller, the water tank isn’t very large – only 1-liter (about 33oz). This can be a bit frustrating if you make a lot of espresso or you have several people using it. In fact, that’s the only real complaint I’ve seen amongst the customer review. This is apart from the usual issues with people receiving damaged units, which is usually about the delivery guys and not the espresso machine itself. The real benefit of its compact design, is that it takes up very little countertop space. So if you have limited space, and you don’t mind the smaller water tank which can produce about 4 full cups of coffee (around 8 espressos), then this is a great machine for you. The Vapore is one of the easiest full-function espresso machines to use. It has simple function buttons, with some program options. The Vapore has intuitive intelligence, so it learns and memorizes your favorite settings. All you need to do is place your coffee beans in the top chamber and select the amount of shots you want (1 or two). It will grind the beans, and in a few seconds you’ll have rich dark espresso trickling into your cup. For frothy milk, it has a rotational steam spout. An important thing to have on any automated espresso machine is a pressure control – start off at low pressure and then increase it. This one does exactly that. You can also get hot water for a cup of tea in an instant. There are 5 grinder settings and this is the only function that requires some effort – though not much. They supply a small tool that fits into a slot at the top of the grinder. You have to insert this tool, then push it down and turn to the grinder setting that you want. So it’s a bit of a procedure, but not something you’ll be doing too often. It has a self-purging function that cleans out the system after each use. There’s no old coffee residue left behind, so every cup is completely fresh. It also has auto descaling to keep the machine in top condition. The removable brewing group, which is the essential working parts, is great. To rinse it or to perform routine maintenance, the brewing group unclips with one touch and slots easily back into position. The machine is compatible with Brita Intenza filters. There are a few LED warning lights to help you keep an eye things. A light will ignite if the water level is low, or when you need clean out the dreg holder is full. There’s also a system fail warning, which doesn’t say much, except there’s something wrong and you’ll probably need to contact your service agent if this happens. While it doesn’t have the sleek finish of the Breville, this is a neat looking appliance in black plastic. The drip tray is metal – looks like it has a chrome finish and is pretty durable. For its simple user functions and compact size, the Saeco Vapore is a real gem. If you’re not into complicated procedures, but appreciate a great espresso made from freshly ground beans, you’ll absolutely love this little machine. Uses Nespresso capsule system combined with De’Longhi’s Automatic Cappuccino System. If you want total simplicity then this is the best espresso machine under $500 for you. Creates the ideal flow of water with 19 bars of pressure. De’Longhi patented “Rapid Cappuccino System”: Best in class of milk frothing solution. Auto Clean System (integrated in the milk carafe): Automatic Rinsing function. Removable Milk Carafe (0,5 l): Can be placed in the refrigerator after use. Electronic Touch Controls: With self-explaining display and option menu. Nespresso Capsule System: Complete with LED illuminated capsule container and separate collecting container for used capsules (up to 15 capsules). Energy Saver: Auto Power Off mode setting after 9 minutes from the last coffee, with adjustable option. Those commercials depicting George Clooney whipping up an impressive looking espresso in an instant aren’t lying. Now the connoisseurs will tell you that the only way to achieve the perfect espresso is to grind freshly roasted beans, tamper the grinds into the basket at just the right consistency and then pass perfectly pure water through it (at the exact temperature), adjusting the pressure to ensure the correct infusion. Perhaps it’s the ritual, or the art of it, but I tend to agree with this. So, in that sense, the Nespresso Lattissima isn’t for me or, for that matter, any OCD coffee nut. With that said, how many people actually notice the finesse that comes with all that effort? If all of that sounds like a load of hassle, then the Nespresso Lattissima Pro is just the thing for you. It’s as easy as instant, probably easier because the water is hot in matter of seconds from the time you start it. Yet, unlike instant coffee, you have the genuine taste of real espresso. Well, almost genuine, but that’s a matter of opinion. Two industry giants have combined forces to bring you the ultimate in convenience, style, and quality. De’Longhi are renowned for manufacturing some of the best appliances in the world, with the flare of Italian styling and elegance. Nestlé are world leaders in the food and beverage industry and are the innovators of convenient, great tasting coffee. Put these two together, and you have a winning recipe. You end up with the Nespresso Lattissima Pro. Learn more about the taste of Nespresso. A big part of this system is the Nespresso Pod, or capsule. Available in three blends (Intense, Mild, or Fruity). The coffee is ground and then packed at just the right amount, into a vacuum sealed capsule. This keeps it fresh and compact, ready for use. Okay, there’s a lot that has been said about pre-ground coffee not being entirely fresh and there’s a bit of science involved here. I’ll talk about this when discussing how to make the perfect espresso. But, for all intents and purposes, the coffee is about as fresh as it gets, without going to all the hassle of grinding it yourself. As for the perfect compression of the grinds, that is also debatable. But, again, in terms of hassle-free convenience, this is the best way of doing things. Having the near perfect Nespresso pod is a good starting point. Then you get the beautiful, brushed stainless steel espresso machine that makes things as simple and foolproof as it gets. Pop the pod into the chamber, push a button, and presto! In a matter of seconds you have beautifully foamy espresso, ristretto, lungo (Americana), cappuccino, or latte. To choose the type of coffee (or the volume) is an incredibly simple process. At the top is a convenient touch pad and LCD screen. Simply touch the button for one of the 6 pre-programmed coffee types and it’s done. You don’t even need to foam the milk. It goes into a container that slots into place. The milk will automatically be frothed and then dispensed into the cup when you select one of the milk coffee options. There’s no cleaning, rinsing, or emptying of coffee dregs. Once you’re done, remove the used pod, toss it into the trash, and you’re ready for your next espresso shot (or any of the six beverages to choose from). The water tank is pretty big – 44-ounces. It is transparent, so it’s easy to check on the water level. Besides, it has a warning to let you know when the water is running low – you really can’t go wrong. It’s really quick and easy to remove and refill the water tank. VIDEO | See how easy the Nespresso Lattissima Pro (EN750MB) is to use. Okay, so the experts say this is not really the way to make a perfect espresso. Question is: will you even notice the difference? Next question: are you prepared to put in all the time and hassle of doing things the barista way? Depending on how you answered these two questions, the Nespresso Lattissima Pro may be the perfect solution. For the busy home or office, I can certainly see the advantage in having this espresso machine. You have the no-mess, no-fuss advantage of instant without the non-genuine taste that comes from granular coffee in a jar. For many, this is a win-win combination. Best espresso machine under $500. Single-and double-shot stainless-steel filter basket. DESIGNED AND MADE IN ITALY : Guarantee of premium quality and a neverending passion for the art of espresso making. FULL BRUSHED STAINLESS STEEL BODY : Tradition meets timeless design for Gaggia Classic, a best-seller stainless steel manual espresso machine, beloved by all espresso aficionados of the world. PROFESSIONAL GROUP AND FILTER HOLDER : The professional chromed brass group and filter holder are designed to ensure a perfect traditional in-cup result, and to give you the pleasure to perform every day the gestures of a real barista, at your home. CLASSIC PANNARELLO : The 180° rotating Pannarello is the best tool to unleash your inner barista. Designed to ease milk frothing, it allows you to make creamy cappuccinos or other milk-based recipes. If you prefer a tea, it also dispenses hot water. STAINLESS STEEL CUP WARMER : The stainless steel cup plate benefits from the warmth produced by the machine and keeps your cups always ready. GROUND COFFEE AND COFFEE PODS : Gaggia Classic comes with a coffee filter with 1 or 2 cups of ground coffee, and a special filter specific for coffee pods. After the Breville BES840XL/A, the Gaggia 14101 is my second favorite on our list of best espresso machines under $500. The good news is that’s it’s quite a bit under 500 bucks. Despite being cheaper than the others, it’s a great quality, Italian designed espresso machine. Beautifully finished in brushed stainless steel. Though at this lower price, you’re not getting all that the more expensive Breville has to offer. These may be minor issues though because all you’re really missing out on is the stainless steel pitcher. It also doesn’t have a pressure gauge. Whilst this is not all that important on an automated espresso machine, it is something I really like. The pressure gauge lets you know that everything is as it should be. The Gaggia comes with three filter baskets, pressurized, non-pressurized, and a pod basket. This last addition is a nice little extra. You have the choice to do things the old-fashioned way by perfectly tempering the coffee into the basket. If you’re not up to that hassle, or in rush, you can choose to use the pod, which means no fuss or coffee grinds to clean up. Unfortunately, it’s almost impossible to find any technical specs for this machine, so there’s some information that I have to try figure whether it does, or does not, do certain things. I see no mention of a water filter, nor do I see where one could be on the machine. So my guess is that it probably doesn’t have one. Not a big deal, you can always use a filter pitcher if you don’t have a water filtrations system already installed in your home. One, quite important fact that I can’t find, is whether the Gaggia adjusts the pressure for coffee infusion. This is a very important step in the process. Since this is a high-quality Italian espresso maker for the home, my guess is that it will adjust the pressure. It seems about perfect in every other respect, so I can’t see how they could omit such an important aspect. What I can tell you is that it pressurizes the water up to 7½-bar (±109 Psi). It has a massive 72-ounce water tank, which is great for multiple cups without refilling. Though it’s a little tricky (but not all that difficult) to remove the reservoir for refilling. Using the Gaggia is about as easy as any of the best semi-automated home espresso machines. It has simple push buttons for selecting your volume, a rotational steam spout for frothing milk, and a dial to select the water flow function – pressurized, non-pressurized, or just hot water. The quality of this machine is remarkable, that’s something I’ve read in numerous reviews. People seem to love this espresso machine and they say it lasts for years with no real maintenance issues. Definitely one of the best espresso machines for the home and it costs well under 500 bucks. For this type quality craftsmanship, it’s a real bargain. Slightly less sophisticated than my favorite in our lineup (the Breville BES840XL/A), but just as competent for making coffee shop grade espresso. It’s up there the best of them when it comes design and high-quality materials. Revolutionary Centrifusion technology to gently brew both coffee and espresso. AUTOMATIC COFFEE/ESPRESSO MACHINE: Brew different single serve coffee cup sizes at the touch of a button depending on your coffee needs – espresso (1.35 oz. ), double espresso (2.7 oz. ), gran lungo (5 oz. ), coffee (7.7 oz.) and alto (14 oz.). SMART COFFEE MAKER: Brew a perfect single serve coffee or espresso cup time after time, thanks to Nespresso’s Centrifusion technology using barcodes to deliver the best in-cup results including the perfect crema for larger coffee cup sizes. The Nespresso Vertuo Coffee machine is a simpler, much cheaper, version of the Nespresso Lattissima Pro. It uses the same hassle-free Nespresso pods which are so convenient and easy to use. The real difference is that the Nespresso Vertuo doesn’t do foamed milk. So you don’t the option for cappuccino, latté, and other milk coffee beverages done for you at the touch of a button. This is what makes it so much cheaper. Though you get the Aeroccino milk frother as a separate item, this is part of the package and doesn’t cost you any extra. So you can add soft creamy milk to your coffee. It just takes a little more effort – not much though. It’s a great looking machine and true to the Nespresso credo, it’s made as easy to use as anyone can hope for. You can choose the type of coffee you want: espresso (1.35oz); double espresso (2.7oz); gran lungo (5oz); coffee (7.7oz) or alto (14oz). All this done by the simple touch of a button. There’s no grinding, tampering, or any cleaning up. Pop the Nespresso pod into position and then throw it away afterwards. Nothing more. The Vertuo pods come in huge selection of flavors and blends – 12 freshly brewed coffees and 4 authentic espressos. You get a sample of each with your purchase, so you can try them and determine which is perfect for you. For the simplicity and convenience of the Nespresso pod system, the Vertuo comes at a great price. The only real difference between this model and its more expensive cousin, is that you have to do some manual work when making milk coffees. The perfect espresso has a great taste that is never bitter and is full of aroma, it also looks great. Whether it’s a frothy cappuccino, latté, or full bodied espresso shot you’re after, it starts with making a perfect espresso. This is a combination of science and art. The science lies in the roasting and grinding of the beans, the temperature and pressure of your water, and a few finer details – like the tampering of your grinds and the softness of the water you use. The art is about combining all these factors with perfect finesse. How do you recognize the perfect espresso? Like fine food or wine, the espresso experience appeals to the three main senses – sight, smell and taste. It happens in that order. So, from the first glance you are enticed by what’s to come. A perfect espresso is dark in color and has a rich golden crema. Crema is the foam at the top of the shot. It should be a caramel type of color with small, consistently sized bubbles that give it a kind of glow. The crema is more important than some realize, it’s an indication of what’s to come. If your crema is the perfect color, consistency and volume, you can be pretty sure that what lies beneath is pure bliss. Crema should constitute about 20 – 25% of the volume of the espresso shot. The smell needs to be wafting and aromatic, leading you to that rich nutty taste. What’s The Best Espresso Machine? To achieve the perfect espresso, you need to have the best espresso machine that you can afford. I’ve discussed a bunch of great home espresso machines in the review. But here are some quick pointers as to what is essential when choosing the best espresso machine. Your espresso machine needs to heat the water properly. This means just below boiling point. So you want really hot water, but not boiling. Pressure is what it’s all about. There’s no exact rule to the maximum pressure required. Your perfect espresso is a combination of the size and tampering of the grinds (more about that later), relative to the pressure of the pump providing the hot water. A good rule of thumb is that the process should take 25 – 30 seconds. The time remains the same for both single and double shots. Ideally, you want to start at a low pressure, this allows the hot water to permeate the grounds and allow for the flavor to infuse. Once this is achieved, the pressure needs to be increased so that water flows through the basket at a faster rate. If it takes too long, the espresso will be bitter. If you want to expand your budget a little then I recommend reading our article which focuses on the Best Espresso Machines for Under $1000. The Breville BES920XL (image above) is one of our top picks in that category. Yes, it’s more money. Some people love their espresso and if you have the money then it’s good to know your options. The best espresso needs the best coffee. Again, there’s no strict rules that apply to the actual coffee or blend that you use. Though most of the specialists recommend using 100% Arabica. I agree with this, but it’s up to you and you may want to experiment a bit to find the perfect one for you. The real important stuff lies in the roasting and grinding of the beans. I know many folks feel that buying pre-ground coffee and storing it in an airtight container is fine. This makes things much easier, but it’s not ideal. If you’re a perfectionist, you may want to know more about the science behind your coffee grinds. Form the time your coffee is roasted, it begins to oxidize. This deteriorates the flavor. Once you grind the coffee, it oxidizes much faster and the deterioration is, therefore, accelerated. You may think that vacuum-packing or storing it in an airtight container is good enough. Vacuum packs are pretty much airtight, but there’s a fair amount of air that’s trapped inside with the coffee when packaged. So there will always be a degree of oxidization that takes place. This isn’t such a big deal, because the ratio of coffee to air doesn’t allow for much oxidisation to take place. Once you open that packet, everything changes. Firstly, there’s no such thing as a re-sealable, completely airtight container. Your coffee is going to oxidize from the moment you open the packet and it will degrade with every passing minute. For your everyday coffee, this isn’t such a big deal if you only store it like this for a week or so. But if you’re after the perfect espresso, this is how it should be. The experts say that coffee should be roasted, left to rest for about 24-hours and then used within 48-hours of roasting. So this is how they would do it in a high-end coffee shop. Though I wonder if even Starbucks uses their coffee within 48-hours of roasting. I find that buying freshly roasted beans from a specialized coffee supplier is important. Though, going back to the store every second day seems a bit excessive in my opinion. Keeping your freshly roasted beans for a week or so, seems fine to me. Maybe not ideal, but I haven’t been able to notice the difference. Before you grind the bean, it’s only the outer layer that begins to oxidize. So that’s all that degrades and it happens quite slowly. It’s very important to grind the beans just before you use them. Because, once ground, every particle is exposed to the air and this means rapid oxidization. Finding the perfect size grind is an art. The science is about how the water flows through the coffee grinds in the basket. This is a combination of tampering, grind size, and water pressure. Most home espresso machines don’t allow you to change the pressure, so you need to grind your beans and tamper the ground coffee to match the pre-set pressure of your espresso machine. If the grinds aren’t compact enough for the water pressure, channels will form in the basket. This will cause the water to rush through and it won’t capture the flavor. You’ll end up with pale, weakly flavored coffee and hardly any crema. On the other hand, if it’s too compact, the water will take too long to pass through and your espresso will be bitter with a dark and imperfect crema. Here’s where the art comes into play. Remember the 25 – 30 second rule. If this is how long it takes, you’ve probably got it right. It may take a few experiments before you achieve this. Typically, a more coarsely ground coffee bean will require more tampering. This means pressing it more tightly into the basket with your tamper. A finer ground coffee should not be tampered to firmly. This will all be relative to the pressure of the water, which is why I say you should experiment a bit until you get it perfect. Your ratio of coffee to water is 1 tablespoon of coffee for every 1.5-ounces of water. That’s a single espresso shot. A double shot will need 2 tablespoons of coffee and 3-ounces of water. The final thing to consider is the quality of the water that you use. Hard metals and chemicals in the water can affect the flavor and even the quality of the crema. The best espresso machines often have a built-in water filter. If this is the case, you can fill your water reservoir directly from the faucet. If not, use filtered water. Many pitcher filters only remove chlorine and a few other chemicals from the water. For the best results, you should use a water purifier with a water softener, these remove the hard metals from the water, thereby softening it. Some water filters even have PH control with a setting for coffee.